Pakistan Tehreek-e-Insaf (PTI) government to ensure that the poor were treated at par with the rich under the law. Addressing a public meeting in Ghakhar, he said today the world was giving weightage to the words of Prime Minister Imran Khan while relations with the Middle East countries had improved under his dynamic leadership. All countries were now looking towards Pakistan, which was playing its due role in the region, he added. The minister said the PTI government inherited a poor economy. Over 84 per cent of the country’s loans were taken by the governments of Pakistan Muslim League-N and Pakistan People’s Party (PPP) during the last 10 years, he added. 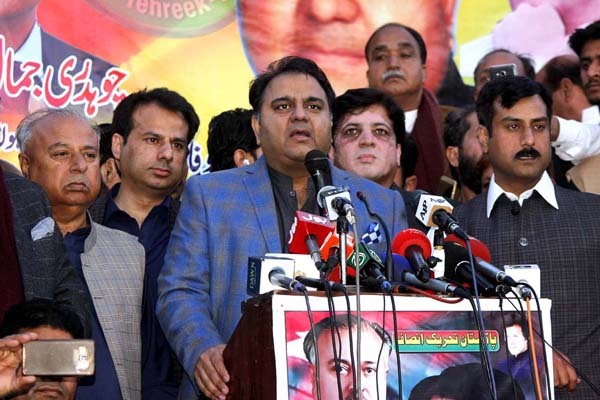 Fawad said Prime Minister Imran Khan did not even spend a single penny from the national exchequer on his residence despite having entitlement while the Sharif brothers had used government funds of Rs 270 million for erecting a wall around Jati Umra. He said when the previous rulers were questioned about foreign loans, they started making a hue and cry that the democracy was in danger. The money, which was supposed to be spent on the development of Gujranwala, Jhelum, Larkana, Ghakhar and other areas, was laundered to Dubai and London, he said, adding Rs 90 billion meant for the Larkana development package was remitted abroad. The minister alleged that the public money was misused by the past rulers. To a question about shifting of Nawaz Sharif to a hospital, he said the Sharifs did not like to be admitted in Pakistani hospitals as they did not improve their condition despite remaining in power for almost three decades. Nawaz Sharif, Shehbaz Sharif and Khawaja Saad Rafique were enjoying even such facilities in jails which were not available to other prisoners, he added. He said the PTI’s coming to power was a revolution of the middle class. Chaudhry Jamal Nasir Cheema and other PTI leaders were also present on the occasion.